Postcolonial Networks – Review of Rubén Muñoz-Larrondo. 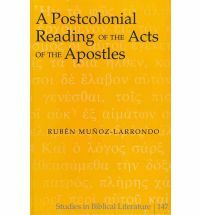 A Postcolonial Reading of the Acts of the Apostles, Studies in Biblical Literature 147. New York: Peter Lang, 2012.
Review of Rubén Muñoz-Larrondo. A Postcolonial Reading of the Acts of the Apostles, Studies in Biblical Literature 147. New York: Peter Lang, 2012.
Review of Rubén Muñoz-Larrondo. A Postcolonial Reading of the Acts of the Apostles, Studies in Biblical Literature 147. New York: Peter Lang, 2012. pp. xiv + 249. I remember well my first introduction to the complex background of the New Testement world. As an undergrad in the early 1980s, I was encouraged to encounter the early church through first century lenses. In so doing, I discovered the way early Christians experienced their faith. In a course on Acts, I recall my attraction to an emerging approach that suggests Luke writes to show that Christianity poses no threat to imperial Rome (see also Bruce 1952; Walaskay, 1983). And from my vantage point, it made perfect sense. How could my comfortable Canadian Christianity pose a threat to any political system? How times change! Over the next fifteen years, this conviction would break down as I began to wrestle with the role of the Spirit in contexts of suffering and persecution in Luke-Acts. This journey culminated in my dissertation (Mittelstadt, 2004). Today, scholars such as Rubén Muñoz-Larrondo push me further. For Muñoz-Larrondo, his social location reflects the increasingly multifarious demographics of global Christianity. Whereas at the beginning of the twentieth century the Christian West and representative colonies owned more than eighty-five percent of the world territory and sixty-five percent of Christians lived in Europe and North America, current statistics reveal a seismic reversal; those formerly in the position of sending missionaries to the rest of the world now represent only thirty-five percent of Christians (p. 8). Though Muñoz-Larrondo and I share similar language and cultural barriers from the world of Acts that our theological training may partially address, our current lens for reading biblical texts surely must also make room for our differing socio-cultural locations. In Acts, Muñoz-Larrondo discerns an encounter between the religio-political authorities of the Roman machine and Lukan claims concerning a new basileos under King Jesus (p. 230). As a diaspora reader, Muñoz-Larrondo argues that Luke’s story functions as an alternative narrative to the oppressive demands of the Roman imperial superpower and related institutions within first-century Judaism. He makes quick work of simplistic praise of Pax Romana (e.g., improved transportation, peace, and protection) and opts for more recent views that emphasize its political agenda, namely, propaganda to justify ongoing exploitation of conquered lands (p. 34). The author of Acts, fully aware of this power conflict, speaks not only to the idolatrous representation of imperial worship and the demands of their “gods in human form,” but also to Jewish leaders charged with restoration of God’s people according to the Hebrew Scriptures. Through inclusion of the Gentiles and the designation of Jesus as Savior of all, Luke crafts a socio-political resistance narrative, announcing that “days of ignorance are over” (Acts 3:17; 14:6; 17:30) and God, who works “according to a definite plan” (Acts 2:23), “now demands from all people everywhere” unconditional allegiance (p. 234). Given Luke’s portrayal of political leaders as liars, full of fear, and seekers of bribes, Muñoz-Larrondo applies postcolonial categories of hybridity, mimicry, mockery, and alterity to demonstrate how leaders consistently pursue supremacy and allegiance. On occasion, certain Jewish and/or Roman leaders who persecute followers of the Way find themselves in the precarious position of “fighting against God” (Acts 5:38). To prove his thesis, Muñoz-Larrondo devotes his most extensive attention to the death of Herod in Acts 12. To portray the symbolic end of the “divine voice” of future emperors and their representatives who parade the imperial cult, Luke employs a host of type-scenes with roots to the Exodus, specifically, deliverance of the oppressed alongside punishment and retribution for self-exaltation and hubris. At the literary center of Acts, Luke uses this story of Peter’s liberation and Herod’s punishment as a turning point that reveals the destiny of the Empire (and anyone) who usurps allegiance reserved for God alone (p. 68). Luke implores his readers to reject the dominant ideology and culture and proclaim “times of refreshing” marked by the “universal restoration that God announced long ago through his holy prophets” (Acts 3:20-21) (p. 73). Originally submitted as a dissertation at Vanderbilt University, Muñoz-Larrondo exhibits the influence of his doctoral director and formidable postcolonial critic, Fernando F. Segovia. Given the emergence of multi-disciplinary methodologies and the dynamic between author and reader based approaches in biblical studies, Muñoz-Larrondo produces a fine work that deserves a wide readership. Educators who teach courses on Acts or hermeneutics should take a serious look at making this required reading. Though not necessarily a primary textbook, Muñoz-Larrondo brings postcolonial questions into the foray of Lukan scholarship. Bruce, FF. 1951. The Acts of the Apostles: The Greek Text with Introduction and Commentary. Grand Rapids: Eerdmans. Mittelstadt, MW. 2004. The Spirit and Suffering in Luke-Acts: Implications for a Pentecostal Pneumatology. Journal of Pentecostal Theology Supplement Series, 26. London: T & T Clark. Walaskay, P. 1983. ‘And So We Came to Rome’: The Political Perspective of St. Luke. SNTSMS 49. Cambridge: Cambridge University Press. Martin Mittelstadt is Associate Professor of New Testament at Evangel University in Springfield, MO. He is an active member of Pentecostals and Charismatics for Peace and Justice (see pcpj.org).